$24.271 million on 2908 screens. Back when Tom Cruise first became a star with 1983’s Risky Business, did anyone predict he’d still be an “A”-list actor 20 years later? Maybe, but it’s still been a terrific run, one that he continues with 2003’s The Last Samurai, a moderate success. In Samurai, Cruise plays American Army Captain Nathan Algren. A Civil War hero, more than a decade after its conclusion he finds himself drunk and disillusioned, as gun makers trot him out to use his experiences to tout their wares. Some old military acquaintances offer him the chance to head to Japan to help train their armies. He and his pal Sergeant Zebulon Gant (Billy Connolly) will teach the Japanese to fight the forces of Katsumoto Moritsugu (Ken Watanabe), a samurai and former instructor of the Emperor. Despite the bad blood between Nathan and his superior officer, Colonel Bagley (Tony Goldwyn), Algren agrees to his former boss’s agreement and heads to Japan. 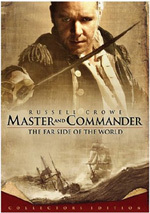 His past still haunts him, however, as the movie alludes to atrocities conducted in the interest of Indian suppression. Simon Graham (Timothy Spall) meets them in Japan and explains the situation. They quickly meet with the Emperor (Shichinosuke Nakamura) and get down to business. The training moves slowly, but his superiors order Nathan to take his forces into battle after Katsumoto attacks the railway. The fight goes poorly, though Nathan manages to acquit himself well. After a vicious confrontation, Katsumoto takes Algren prisoner. They go to their mountain hideout, where Katsumoto’s sister Taka (Koyuki) tends to his wounds. He recuperates and gets to know more about his captors. Before long, he learns that Taka was married to Hirotaro, a warrior Nathan killed in battle. He’s stuck there until the spring, when the snow melts and the passes open, so Nathan gets a lot of time to discover more about them. Gradually Algren gains an appreciation and respect for his captors. He also trains in their ways and develops new skills as a warrior. Taka doesn’t like his presence, though, as she feels this shames her. However, as she sees how he integrates with the others, she starts to warm to him, which seems to set the stage for some romance. After a ninja attack on Katsumoto and the village, they reach a brief truce with the Emperor’s forces so they can return Algren. He goes back to his compatriots and sees the progress Bagley made with the men as well as the arrival of new artillery. Katsumoto also meets with the Emperor, as they discuss the current state of affairs. Algren finds his loyalties tested by the progress of the Emperor’s armies. It looks like the two sides will come to fight again, and Algren may be forced to lead the forces against Katsumoto’s side. The rest of the movie follows his choice and its ramifications. 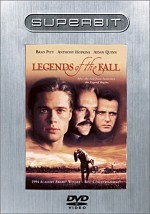 With flicks like Legends of the Fall and Glory, director Ed Zwick showed a predisposition to convert history into mythology. This worked in the fairly effective and vibrant Glory but failed in the tepid romance novel that was Legends. Samurai falls somewhere between that pair. While it fails to live up to the merits of the rich and compelling Glory, it also manages to escape the excessive romanticism of Legends. Actually, Samurai most closely resembles Dances With Wolves, though it also fails to live down to Costner’s politically correct epic. To be sure, the pair share a lot of similarities. Both feature disillusioned and borderline suicidal Civil War heroes who “go native” when they meet foreign cultures. Both also paint the latter in a very positive light and tend to make the forces that oppose them seem dimwitted and cruel. However, Samurai fails to paint with strokes as broad as seen in Wolves. The good guys aren’t quite so pure, and the baddies don’t come across as quite so evil. The two sides don’t take on such clean racial divisions either, as Samurai boasts a few treacherous Japanese. It’s not a tremendous distinction between the two films, but it exists and makes Samurai easier to take than the preachy Wolves. That said, Wolves actually offers the better made and more entertaining film once one gets past the political correctness. That’s because Costner’s flick featured actual characters, unlike the thin personalities who populate Samurai. Despite the best efforts of the actors, they rarely seem to become truly three-dimensional and engaging. Mostly they come across as moderately thin concepts without much depth. That leads me to the film’s weakest element: its star. Cruise seems badly miscast as the haunted war veteran. He can’t pull off the necessary grittiness, and I simply find it very difficult to accept him as a hardened expert killer. Cruise is a more than competent actor, but he goes too far beyond his boundaries in a role much better suited for someone like a younger Clint Eastwood. As usual, Zwick seems more concerned with creating glorious mythology than with telling a coherent story, but he does provide some very good battle sequences. He also treats the film’s putative romance with surprising restraint. It seems inevitable that Nathan and Taka will connect, but the movie delivers that sequence with unusual tact and subtlety. This makes the flick come across as more believable than it otherwise might. Ultimately, The Last Samurai provides a competent but erratic movie. I can’t call it a bad film, as it enjoys too many good components to fall into that category. However, it lacks much depth or purpose, and too often feels like little more than an excuse for some lovely vistas and stirringly heroic sequences. 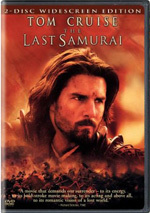 The Last Samurai appears in an aspect ratio of approximately 2.35:1 on this single-sided, double-layered DVD; the image has been enhanced for 16X9 televisions. I expected a solid visual presentation for this film, and I got what I anticipated. Sharpness seemed virtually immaculate. I noticed no instances of softness that marred the image. Instead, the movie remained nicely detailed and crisp from start to finish. No jagged edges or shimmering occurred, and only a little light edge enhancement cropped up from time to time. As for print flaws, the movie seemed free of them. Samurai presented a fairly natural palette that imbued a moderate golden tone at times. This seemed appropriate for the setting, and the movie took pains to bring out the beauty of the Japanese countryside. The colors looked warm and precise at all times. Blacks seemed dense and dark, while shadows were appropriately thick but never too murky or excessive. Overall, the picture of Samurai seemed very satisfying. In addition, the Dolby Digital 5.1 soundtrack of The Last Samurai worked well. Nor surprisingly, it fared best during the film’s fight sequences. These used the various channels nicely, as they kicked into action. Those moments featured a lot of material from all the speakers and made the battles aggressive and involving. Otherwise, the track manifested the environment in a satisfactory manner. Natural elements cropped up from the appropriate locations and blended together well. Music also offered good presence and delineation. Audio quality appeared positive. Speech came across as concise and natural, with no issues connected to edginess or intelligibility. Music seemed a little subdued but mostly sounded bright and lush, with tones that delivered the score well. During a few occasions, I felt the effects were a bit metallic and harsh, but those occasions didn’t dominate the film. Instead, the elements mostly presented accurate and well-recorded material with clarity. Low-end response was quite good, as bass seemed tight and warm. Though not a stellar track, the audio of Samurai proved effective. For this two-disc DVD, we get a slew of extras. Only one of these appears on DVD One: an audio commentary from director Ed Zwick, who provides a running, screen-specific discussion. Among other things, he gets into research and historical considerations, casting and working with the actors, character concerns, thematic subjects, visual design, sets and locations, and various logistical issues. Zwick provided a pretty good feel for things and made this a reasonably informative track, though I must admit he never offered a very compelling presence. I often started to drift off and found it tough to focus on what he said, as I rarely became terribly interested in the material. Since Zwick covered all the appropriate material in a thorough and concise manner, I can’t really criticize the commentary, but I also didn’t much enjoy listening to it. Now we head to DVD Two and its supplements. We open with Tom Cruise: A Warrior’s Journey. This 12-minute and 52-second featurette presents the standard combination of movie clips, behind the scenes materials, and interviews. We get notes from Zwick, actors Cruise, Hiroyuki Sanada, Shin Koyamada, Masato Harada and Ken Watanabe, producer Paula Wagner, producer/screenwriter Marshall Herskovitz, associate producer/Japan casting Yoko Narajashi, and stunt coordinator Nick Powell. They cover character notes and the samurai code, Cruise’s preparation and training for the role, “Journey” includes too many movie snippets, and these bog down the program. It also seems generally fluffy and without much substance, as we mainly hear about the glory of Cruise. It doesn’t give us much of interest. In Edward Zwick: Director’s Video Journal, we find a 26-minute and 14-second look behind the scenes. We see video footage from the set that Zwick narrates. Among other things, he chats about locations and sets, photographic techniques and working with the cinematographer, visual choices including props and costumes, working with Japanese crew, authenticity, and fight choreography and practical visual effects. It’s a fairly good view of the shoot, and Zwick’s narration adds depth to the piece. Conversely, however, it’d be nice to be able to turn off the narration and hear the audio from the set on its own; Zwick’s commentary gives us perspective, but it’d also be fun to get more of a “fly on the wall” feeling. Next we find Making an Epic: A Conversation with Edward Zwick and Tom Cruise. It goes for 17 minutes, 46 seconds as it offers exactly what it implies: a discussion between the director and the actor. We also see some movie snippets and shots from the set. They get into their early meetings together about the movie, personal connections to the material, goals for the flick, story issues and the shoot, language issues and casting, and rehearsals. Expect more mutual backslapping here, as the pair don’t tell us much of substance. However, the behind the scenes clips are good, as they offer some nice glimpses of the production. A History Channel program, History Vs. Hollywood: The Last Samurai lasts 22 minutes and four seconds. It uses the standard format and includes interviews with Zwick, Cruise, historian/author Mark Ravina, and military historian Geoffrey Wawro. They discuss some story elements about the movie, the history of the samurai and their code, information about Japan with a particular emphasis on the era in which the movie takes place and how their society got there and beyond, the impact of this material on the film, and how much of Samurai resembles historical fact. The program keeps fluff to a minimum as it provides a tight look at history and its enaction in this film. It’s probably the DVD’s most informative piece. Next we find a series of fairly short featurettes. We get A World of Detail: Production Design with Lilly Kilvert (seven minutes, 10 seconds), Silk and Armor: Costume Design with Ngila Dickson (6:25), Imperial Army Basic Training (5:40), and From Soldier to Samurai: The Weapons (5:05). In these we hear from production designer Kilvert, Zwick, costume designer Dickson, Herskovitz, Wagner, costume props head technician Roger Murray, off set 3rd assistant director Louise Boothby, key off set second assistant director Geoff Dibben, military technical advisor Sgt. Maj. James D. Deaver, prop master David Gulick, armorer Gunner Ashford, battle extra Mark Okita, assistant military technical advisor Daniel King, firing weapons coordinator Robert “The Rock” Galotti, cannon master C. Robert “Bob” Gillmor, assistant prop master Peter Clarke, actor Shin Koyamada, assistant prop master Parker Swanson, and special effects supervisor Paul Lombardi. They discuss fashioning the sets, the general visual presentation and details, costume choices and their creation and influences, training extras, and the movie’s weapons and battle concerns. Each of these explores its subject nicely. They move reasonably briskly and offer solid examinations of the material. We learn some nice details in these informative and well-executed featurettes. Bushido: The Way of the Warrior gives us some information about the samurai code. It presents stillframes of text with information about concepts such as “Duty and Loyalty” and “Complete Sincerity”. It’s a moderately interesting piece. After this we locate two deleted scenes. We see “The Beheading” (101 seconds) and “Algren and Katsumoto” (two minutes, 17 seconds). The former shows a conflict between a samurai named Ujio and some modernized Japanese that forms Algren’s first encounter with one of the warrior elite, while the latter offers a discussion between the pair about killing, honor, and the unstoppable force of modernization. Both seem reasonably intriguing but would have been somewhat redundant in the final flick. 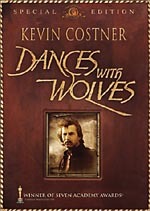 The deleted scenes can be viewed with or without commentary from Zwick. He aptly tells us why he cut them and tosses in a couple of additional notes. In addition, the first segment comes with “Behind the Beheading”, a two-minute featurette. Visual effects supervisor Jeff Okun tells us how they executed the execution in this tight little piece. Lastly, we get the movie’s theatrical trailer and Japan Premieres. The latter runs six minutes, 55 seconds and shows Cruise, Koyuki, Watanabe and a number of the other actors as they show up at the events and chat about the flick with the press. They offer some generally fluffy remarks about the film and that’s it. The program is a decent curiosity but nothing more. The Last Samurai presents attractive visuals and occasional scenes of excitement, but that’s about it. It seems to lack much substance and seems too erratic to succeed. The DVD presents excellent picture and audio plus an inconsistent but generally fine set of supplements. A solid release, fans of Samurai will feel happy with this package, but I’d advise a rental for those new to the film.